You don't need distilled water - city water has minerals and chlorine. No prob with a few minerals and the chlorine is totally removed with sterilization. I've tried a food processor to chop the rice - just about burned it out going for 30 minutes with about the same results you have. Seems that you do indeed need a grinder of some sort. You could use the big coffee grinder they have at the supermarket near the bulk whole bean coffee if you are sneaky. It's real fast and can do that whole rice bag in about 30 seconds. You will get a bit of coffee in your BRF and the next person will get some BRF in their coffee . I don't think socks are gonna warm up your jars. 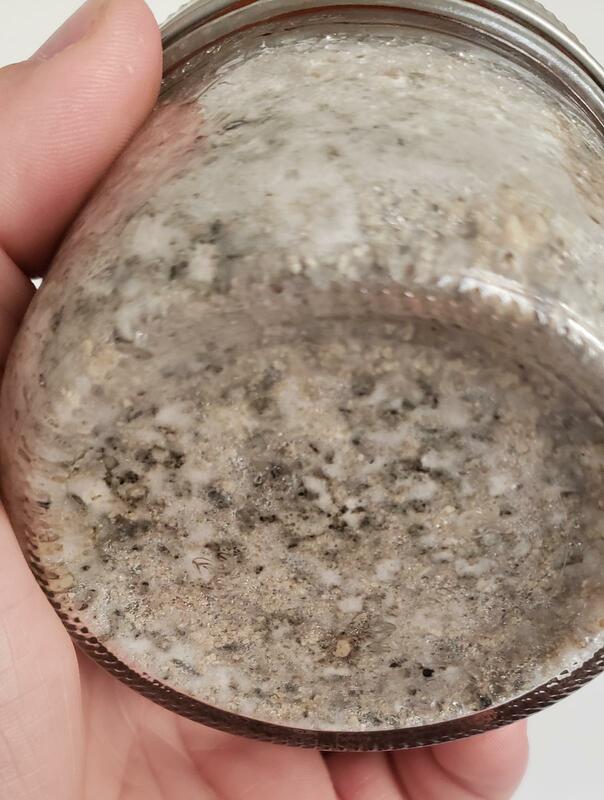 Myc is initially pretty inert and the jars are small. Myc does generate some heat but will be a while until you have any myc at all. Looking forward to seeing your results!! Edited by raymycoto, 21 December 2018 - 07:11 PM. I got something similar to this, and gets rice finely ground in less than 5 sec. I love this little thing. Even crushed ice easily for smoothies. Comes with different sized cups as well. Fits much more than a coffee grinder, too. @raymycoto - Thanks for the tips! The processor, as you mentioned, is pretty ineffective, but so far, things seem to be alright with the rough chop. And the socks, while not that functional, are really there to act as an insulator, since the room the jars are in is chilly. They are in a box, with the flaps folded close, and sitting close to the heater vent. The air is blowing against the side of the box, in the hopes it will help keep things warm (I don't have any other heat source available). So far, I'm not seeing any development in the jars, but it is still early and it is cool in here. I am tempted to relocate the jars to that awesome but under-used cupboard above the fridge... I hear that's an ideal spot for things like this... What do you all think? In the meantime, I'm gonna go die in a hole somewhere... got the worst cold/flu I've had in a long time. I don't get sick often, but when I do, I get it baaaaaad... I'll be back in a few days to report on development! Hope your holiday is fun and happy! May your days be myco-tastic!!! So I have been keeping an eye on the jars (read: checking every day), and there is only one that is showing anything. It's getting cloudy and white, which I can only assume is good! Is there something I am not doing that I should be? The other jars don't show any signs of contamination, at least! 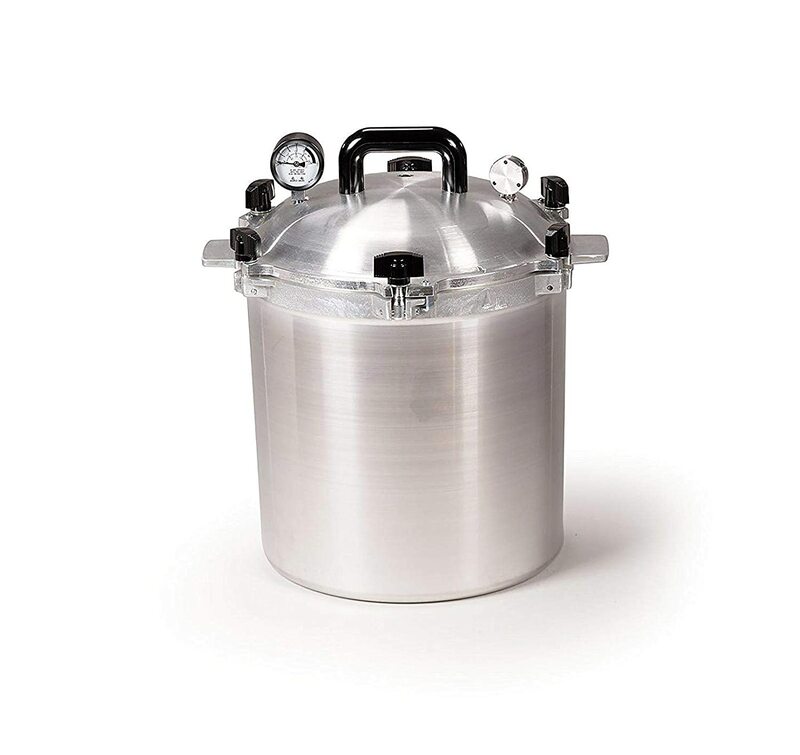 I'm looking at pressure cookers right now (got some monetary gifts for the holiday); are there any suggestions on size? Edit: I'm also going ask my sis to borrow her Magic Bullet, so I can try the PDF again, but this time with actual flour. Edited by OldAndMiserable, 29 December 2018 - 08:47 AM. Colonization rates are pretty variable. To give a typical example, on Dec. 18, the day after you inoculated your jars, I started two sets of six BRF jars. I used two spore syringes from the same supplier, one Chitwan and the other Hawaiian. 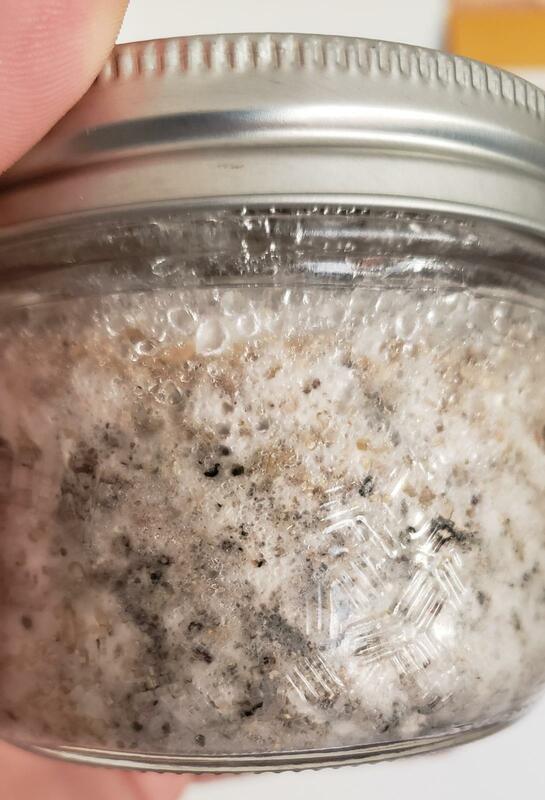 The Chitwan jars took off, and have fully colonized. They're white as snow, and ready to birth. Most of the Hawaiian jars show very little growth (only one has large areas of growth, and some have none). It can be hard to pinpoint the cause of differential colonization rates. In this case, a genetic cause seems likely (Chitwan has a reputation as an aggressive colonizer); but it is also possible that this particular Hawaiian syringe was poorly prepared. To know, I'd have to do a parallel grow with multiple syringes from the same genetic stock. 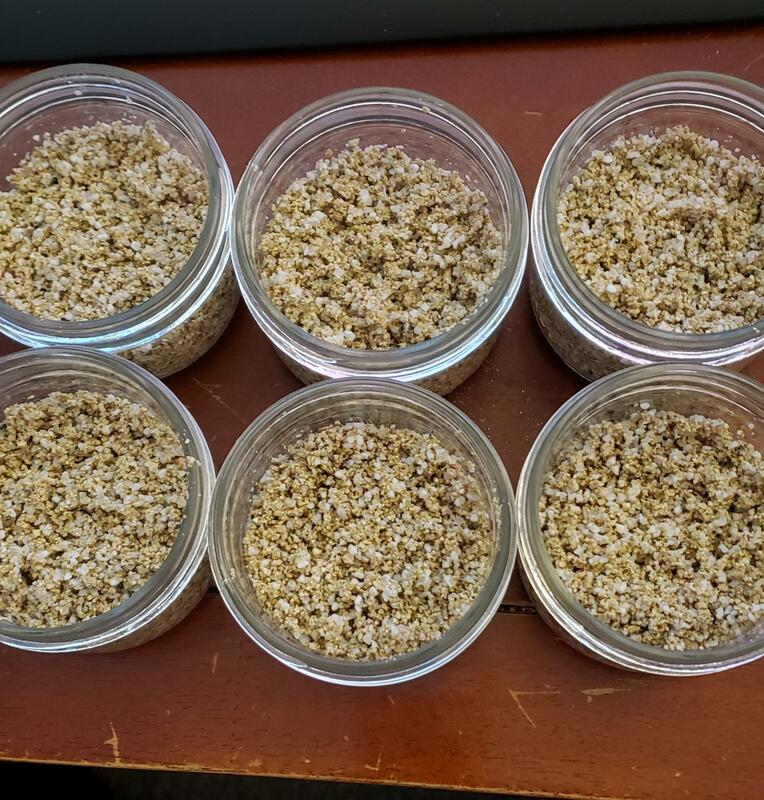 About the same time, I inoculated a couple of batches of rye-grain spawn, using agar cultures isolated from a Cambodian print. Half are in 1L wide-mouth mason jars, and the others are in Ziploc Twist n' Loc containers. Both have similar air-exchange holes (3/8 inch holes, covered with three layers of micropore tape). The Ziploc jars have colonized much more quickly. Again, it's hard to say why. Maybe the Ziplocs, with their wider aperture, are getting better aeration? Or maybe the shaking was more uniform, because of the shape of the containers and the no-stick plastic? 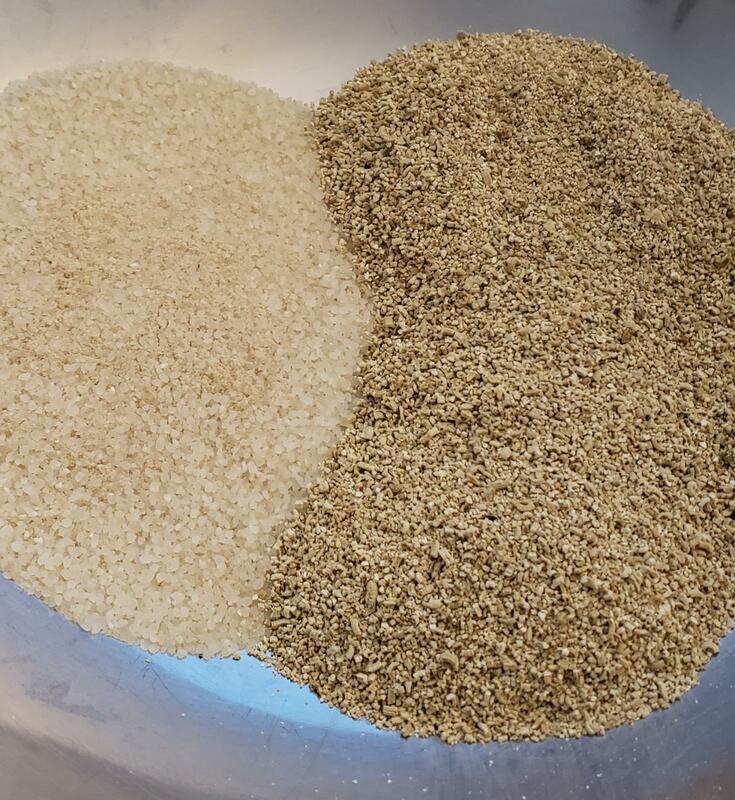 I guess I could get all scientific about it, and do some more side-by-side grows, but I'll probably just switch over to Ziplocs for all my grain spawn. As for the pressure cooker: bigger is better. 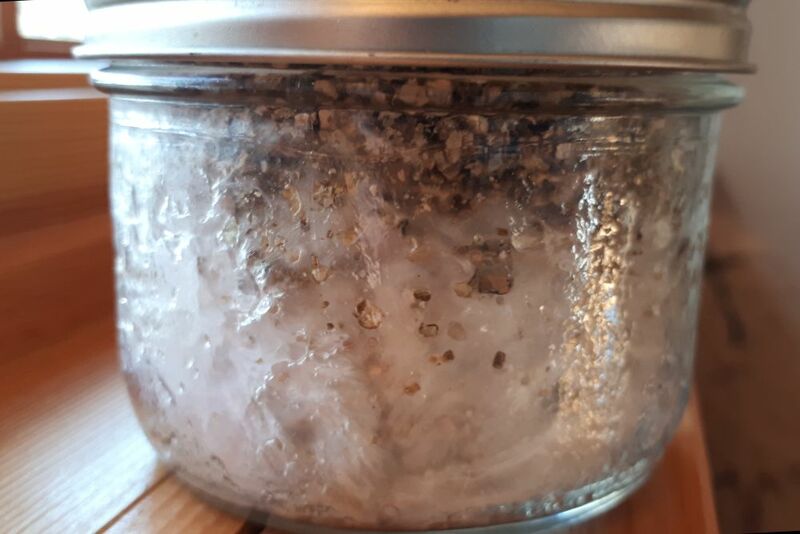 For half-pint BRF jars, you can get away with a smallish pot, but if you stick with this hobby, you'll soon want to sterilize larger jars, and/or bags of spawn. As I recall, a 16 quart pressure Presto is tall enough for litre-size jars. 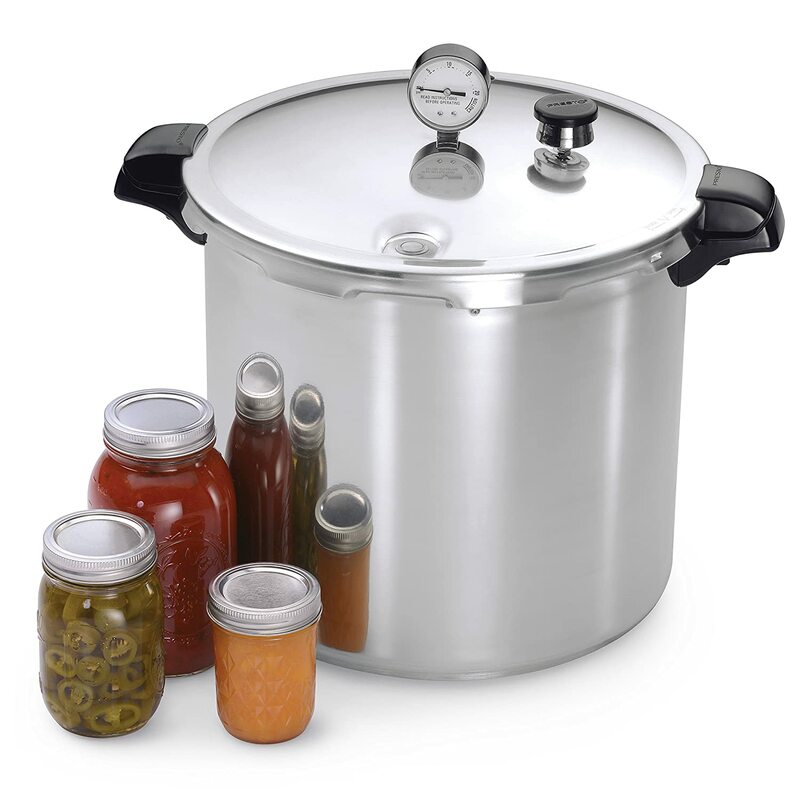 I really like the 23 quart Presto, which I picked up for $140 CAN, at a local hardware store (the All American pressure cookers are superior, but also a lot more expensive). If possible, get one with a gauge. If you can't see the pressure, it's tempting to blast the pot with too much heat, which can lead to excessive water-loss, and even "doming" of the aluminum bottom (did this twice, back in the 80s!). By the way, why have you kept that foil on your jars? The dry verm layer above your BRF provides sufficient filtration of contaminants...as long as you don't jostle them too much, or keep them in a really foul place. Edited by WalkingCatfish, 29 December 2018 - 10:02 AM. Sorry, brother, that doesn't look too good. That black stuff is mold spores, the kind you don't want. Oh well. Not much I can do now but learn and move on! 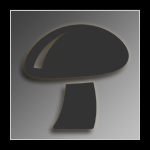 I happened across an old thread from this site while looking at different ways people have grown over the years (link: https://mycotopia.ne...peanut-shells/)and I was wondering if anyone could offer comments about it? I still have a ton of shelled peanuts (dry roasted and unsalted); maybe a test is in order... Maybe I could grind up the shells and mix them with some brown rice flour to try again? The peanut thread you are referencing uses the shells of the peanuts in a substrate... You are still going to have to get your spawn tek down to be able to use the peanut shells... I know that some WBS has peanuts in it and that a lot of people sift them out. I think you would have a hard time using the peanuts them selves but could use the shells if you wanted to go through the process of shelling them. The time to think about "something new" is after you've done a series of successful grows and are knee-deep in dried mushrooms, and you're getting bored with how easy and predictable it's all become. I wouldn't hold out much hope for the remaining five jars, I'm afraid. I hope I'm wrong, but it's been a couple of weeks, now, so I suspect they are being overwhelmed by a bacterial contaminant. Next time, steam (or PC) for a full 90 minutes, and no whole rice. The standard mix is 1/2 verm, 1/4 BRF, 1/4 water, filling the jar to just below the threads, then a layer of pure dry verm above that. Edited by WalkingCatfish, 02 January 2019 - 02:57 PM. At someone mentioned already, the grow was with the shells. There are a bunch of things you can grind and add or substitute in the PF tek. 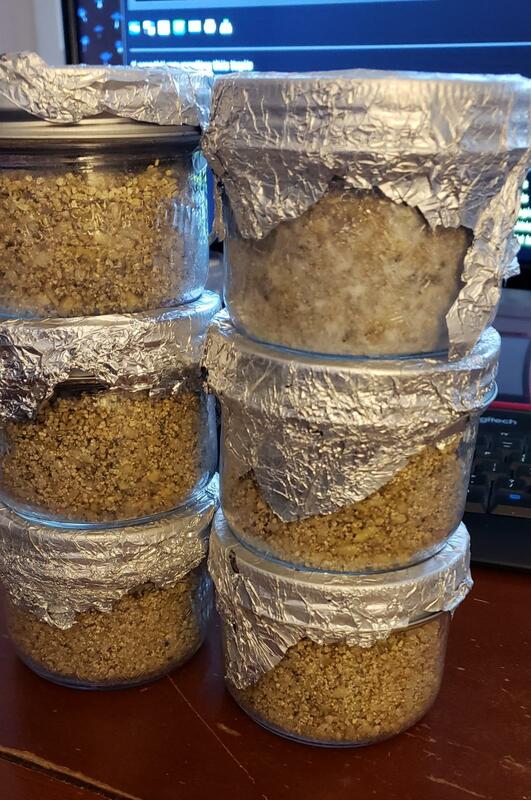 Just get a couple grows following g the tek to a T, then experiment like crazy. I use half water half coffee instead of pure water. I even substitute half the brf for WBS flour I grind myself. I'm even trying RGS instead of BRF...have fun, if you use common sense most will work. Check out Hippie3s supercake formula, and there are also some great "Pancake" recipes for pans and dunglovers. I'll stick to my guns and say almost any whole grain can be used, but some are just not worth the effort to prep. Peanuts contains a whole bunch of oil, probably too much for the mycelium to grow healthily. During the PC process, there would probably be alot of byproducts coming off the peanuts, making for a starchy, sticky, dense substrate. Not what you want for airy mycelium. You probably be able to figure a way to remove some oil and prep them in a way that is repeatable and maybe even worth doing, but I'd stick to one of the more proven and reliable grains. Look through the vaults there are grows on some very funky grains. I even used a lot of pure Safflower seeds. Earlier in the thread you posted a pic of a spore syringe just sticking out the top of a jar. That suggests to me that you're being kind of casual about inoculations. Reaching for that grubby old camera or phone, right in the middle of the job...well, it's not something I'd be brave enough to do, even in a well-sanitized SAB (and it looks to me like you're doing the inoculation in an open oven). So, try to be a bit more nervous about environmental contaminants. Take your operation out of the kitchen (heavy spore load, there). Make yourself a simple SAB...even if it's just a cardboard box turned on its side. Drench the inside with isopropyl alcohol. Wear gloves, slop them with isopropyl alcohol as frequently as you remember (and certainly after you touch anything as foul as a phone ). Wipe down the outside of your syringe with alcohol, and be fastidious about flaming the needle every time you start on a new jar. Mutter a prayer to the Greek goddess Hygieia..."O Daughter of Asclepius, may all corruption and defilement be banished forever from my jars..." etc. Inoculate each jar without pausing, in a quick series of movements--bing, bing, bing, bing. Then put your jars in a cozy spot, and don't look at them for five days. Edited by WalkingCatfish, 02 January 2019 - 03:45 PM. Catfish gave great advice. I've got one more small addition. Get a sponge, the really squishy foam kind. Cut a piece the length of your innoculation needle. Soak it in alcohal, squeeze most of it out then put it on your clean needle as a cover. You can innoculate with it on, and since it is squishy it will shrink to give you room to get deep into the jar, then pop back into place all while sterilizing the needle, and preventing contamination from landing on the needle. It's a little trick I found somewhere here in the vaults, and I haven't had a single case of contam due to innoculation, even in open air, which I admittedly do quite often. And I have literally done hundreds of innocculations using this method. Oh yeah, wear a doctor's mask or painters mask...whatever. The largest movement of dirty air that comes in contact with your clean space is from your lungs. Edited by Deleena24, 02 January 2019 - 03:55 PM. Thank you all for the awesome advice! I was a bit too excited with this run... Next time I'll invest a lot more time in better sterilization techniques, and find a way to render the rice to actual flour. @WalkingCatfish: It wasn't an oven lol it was a dark green plastic tote on it's side with plastic wrap over the opening. I had cut holes in the plastic 'window' and used the puffy rolled-up sleeves of a freshly-washed sweater to block them as I worked. It wasn't perfect, I know, but it was the best idea I had with the stuff I could find around the house. I did wipe down the tub with alcohol the night before use and the morning before the inoculations, as well as wipe my hands and wrists. Next time, I'm going to lock myself away in the half-bathroom downstairs, after it's disinfected. @PJammer24 and @Deleena24: Thanks for the tips about the peanuts! My brain is constantly thinking about this subject, coming up with so many ideas left and right... but I won't be acting on them until I have successfully grown something... besides bad stuff... I really like the idea of the syringe sponge!!! Update - managed to steal my sister's Magic Bullet mixer, so I will have some nicely ground flour for the next go!!! Is there a certain amount of syringe I should use per jar? Per the 4 hole PF tek, .5 a ml per hole is plenty if the spores are nicely dispersed in the syringe. For LC the same is fine, but when I know I am using it I tend to make my mix a tiny bit dry so I can go heavier on the LC. Make sure to tilt the jar so the spore water runs down the glass and not into the substrate. Ideally it will reach the bottom and colonize from the bottom up. All mixed together and put into freshly washed jars ( I know... should have used new jars... but with no money, it's hard to get some. 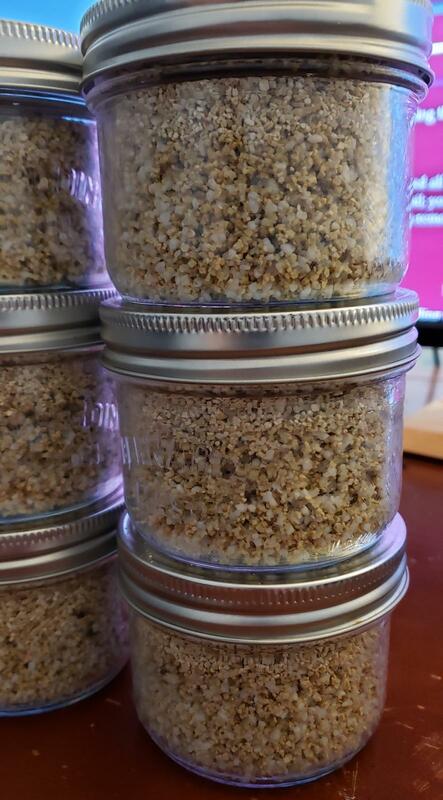 I am re-using the same jars I used before, but I soaked them in a bath of super hot water and alcohol for a time, then rinsed them with hot water and dried them with a clean towel. I then wiped them out with a cloth covered in alcohol and left them to dry. If these contaminate, it shouldn't be because of the old jars). I'm currently building a Still Air Box, consisting of a cardboard box lined with styrofoam (came in a freezer food shipment). I'm wrapping the styrofoam in a few layers of plastic so they can be wiped down easily for sterilization. The open flaps will be removed, and a "window" will be made with more plastic. Once it's built, I'll make a syringe using the spores from my gift (YOU GUYS ROCK!!! THANKS SO MUCH!!!) in the box while the jars are steaming for at least 90 minutes before coming off the stove. I'm off to wrap styrofoam... If anyone has any tips to offer, I look forward to reading them! You mentioned you were looking for a pressure cooker and asked about what size to get . But they are also very expensive ,I got lucky and found a cpl AA at thrift stores . . The best deal right now on a new pressure cooker is the 23 qrt Presto on Amazon . $67.00 & FREE Shipping a comparable size ALL AMERICAN is about $300 . For comparison here is the 25 qt ALL AMERICAN Also on sale . Edited by bezevo, 03 January 2019 - 12:10 PM.